In Case You're Not Familiar! 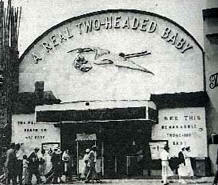 For several years we operated a Freak Baby Show with 20 real human pickled punks. It was very well received by the public, and was very lucrative, requiring only two people to operate. On July 17, 1977 at Grayslake, Illinois the show was raided by a platoon of police. They confiscated the punks, and arrested my partner C M Christ on charges of illegal possession of human remains (not a licensed mortician in the state and county, and illegal transportation was a second charge. We retained a very good (expensive lawyer) and C M stood trial. Bond was posted so he could continue to travel out of state. Several trips back to give depositions, and other preliminaries, then to stand trial, which was in Oct '77. Because we had previously exhibited at the state fair in Springfield and other locations in the state and research proved similar exhibition appeared at the "Century of Progress" worlds fair in Chicago in 1933-34, and other facts, C M was acquitted. Part of the acquittal agreement was that we didn't get the punks back. If things hadn't gone his way, he was facing a possible twenty year sentence. A few weeks later, in August 1977, the local authorities with a search warrant, went through our storage facilities in Gibsonton and found two old punks which were not good specimens, therefore were not in the exhibit. In conducting their search, other materials were damaged and left outside to be damaged beyond repair. I was arrested in absentia, on similar charges. My Tampa attorney was able to get the charges dropped. Because all of this hit the wire services the publicity was nationwide. As a result of the publicity, numerous other pickled punk shows across the country were raided and punks confiscated. This included the beautiful "Woman" show owned by Lou Dufour, with the confiscation of his exhibits which were well worth over one hundred thousand dollars, and of course put that show out of business along with others. I always try to alert any one who is, or anticipates such exhibits to make sure they are not placing themselves in jeopardy. The charges were "human remains corpses, or human body parts". In Nov of 1977 the sheriff (who had confiscated them, conducted a formal funeral assisted by a Catholic Priest, a Protestant Minister and a Jewish Rabbi, a four column five inch photo showed the four people standing behind all the little caskets, as they conducted the final "respectful services for the "carnival babies' That closed the entire affair and with that hitting the wire services, it was the final publicity. We were in New Orleans and saw it in the local Times paper there. the final one being the grave side photo.